This past weekend in Yokohama, 25,000 Japanese fans gathered for Tales of Festival 2013 over the course of two days. And since the conversation at an event like this turns to all things Tales, we at Kotaku East decided to give voice to a few fans about their favorite Tales games and more. 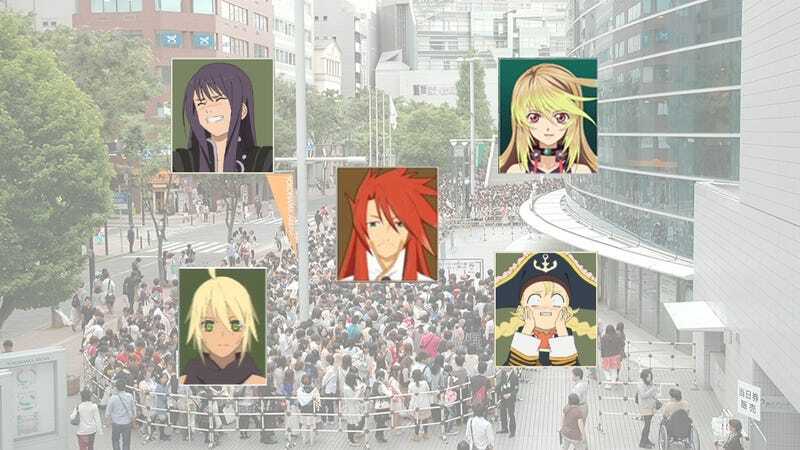 As you’ll see from their responses, these fans have favorites across the entire series, and they are definitely loyal to the core when it comes to Tales. Since 2nd grade in elementary school. How did you get into the Tales series? I watched my big brother playing it and I wanted to play, too. My friends recommended it to me so I gave it a try. It was kind of a coincidence; I saw the cover, liked it, and decided to try it. My friends were fans of the series and recommended it to me. My friend Takai introduced me to it. Since 4th grade in elementary school. My mom bought it for us to play coop together. My friend told me about it so I gave it a try. I haven't played a Tales game myself yet. But I plan to start playing Tales games sometime in the future. Since Tales of Eternia came out. I liked RPGs and when I went to the game shop and looked at the games, it looked interesting. I thought the battle system looked fun. My friends told me it was fun so I played with them and they were right!